PSD is a pixel perfect graphic design which is very eye friendly and gives the clearest view of the art. Hence converting PSD to Web template will deliver the ultimate outstanding visibility to the graphics that is to be implemented on the websites. In the present scenario of modern business it is important to understand the value of a good website design. If you are looking for a website that is unique, dynamic and current then PSD web template design is very appropriate and that will definitely meet the requirements of our clients. No matter who you are or what your business may be, you will always want your website design to stand out. Having an extraordinary website allows you to stay on the mind of most of your visitors and can help translate how unique your product or service is to someone. 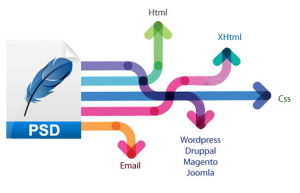 Why Omkarsoft for PSD to Web design Template? It is very important to know the PSD services widely and these services are very helpful to improve the performance of your business. Our professionals are aware from the attractive colors and combinations that are used in the PSD web template design. Our team is a multi-platform blend of custom design services for small, medium, large enterprises and web developers who need high-quality design for their project in a restricted budget. Omkarsoft offers high quality PSD to Web template conversion services at reasonable costs in a quick turnaround time.